Attention all gaming enthusiasts. This week, the 33rd edition of the world’s biggest game fair will be held in Essen Germany. That’s right, we are talking about Spiel Essen 2016. For those who haven’t already been to this amazing event, we have collected 9 game breaking reasons why you should definitely attend this year! Yes, you are reading this correctly. Spiel Essen will last for no less than four days. The opening hours combined, this results in about 35 hours of non-stop gaming pleasure. So there is plenty of time for the strategic masterminds among us to plan their moves! Spiel Essen welcomes game enthusiasts of all ages. Don’t be afraid to bring your kids along because they will have the time of their lives. Alongside the numerous board games and card games for children, there is a huge variety of toys just waiting to be explored. They even transformed an entire hall into an adventurous playground with climbing areas, juggling, an XXL tabletop kicker, a bouncy castle, and much more. This game fair is the perfect place for playing your favourite games and discovering new ones with people that are as passionate about games as you are. And they come from all corners of the world to share this amazing experience with you. It’s time to forge new friendships and unforgettable memories. Spiel Essen is the place where you have the opportunity to test over thousands of games for the very first time. And his year it is rumoured to be no less than 1200! That are just about enough games to keep you occupied until next year! Always wanted to put your skills to the test against other talented gamers? Then it is your time to shine. You can enter numerous competitions for free like Catan and Magic: The Gathering. Good luck! 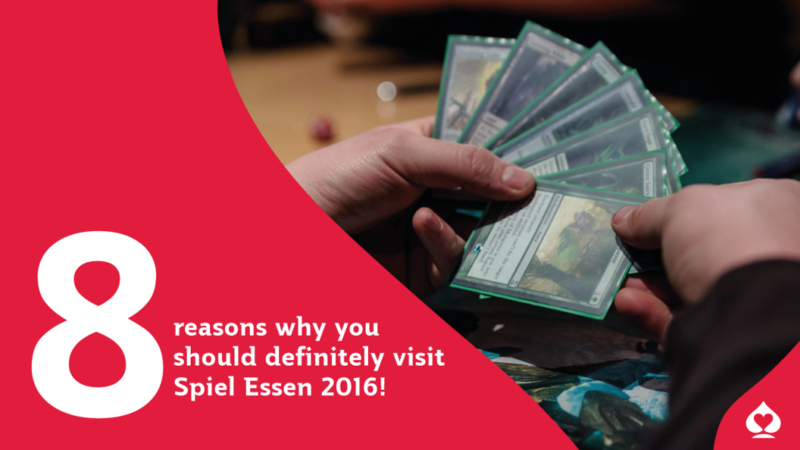 Apart from having fun, there is also room and time to learn at Spiel 2016. You can follow inspiring sessions and talk with various game creators. Maybe you always had a crazy idea for a board game but you had no clue where to begin? Well, this might be the perfect place to find the information you are looking for! If you are a comic book fan as well, you are definitely in for a great time because Comic Action 2016 takes place simultaneously as a part of Spiel 2016. At this convention you can read and buy comic books and other geeky stuff. There will also be numerous well-known illustrators ready to meet you and sign their work for you. The gaming industry keeps on moving forward. Many companies like Cartamundi thrive to be as innovative as possible regarding the creation of games. We will also be at Spiel 2016, so feel very welcome to visit us and discover what we have in mind for the future of gaming! See you at Spiel Essen 2016!